The breeding season in the Breeding Centre of Loro Parque Fundación is advancing at a good pace and this year there are already more than 350 ringed chicks. 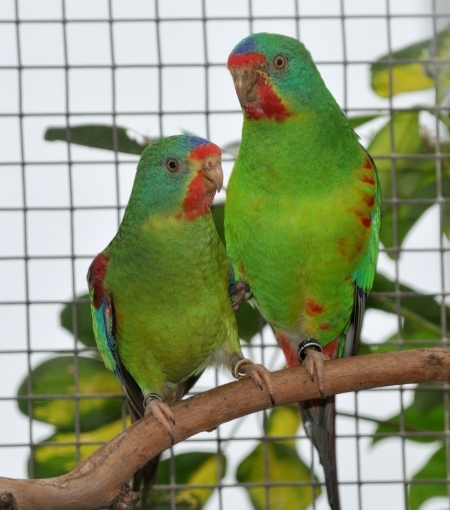 The Swift parrot (Lathamus discolor) is one of the species that we regularly breed in Loro Parque. It’s a species easy to keep and common under human care, but whose situation in the wild gets alarmingly worse. It’s called the Swift parrot because it nests in the island of Tasmania, in the south of Australia, but out of the nesting season it migrates up to 5000 km to find its favorite feeding sites in the south-east of the Australian continent. 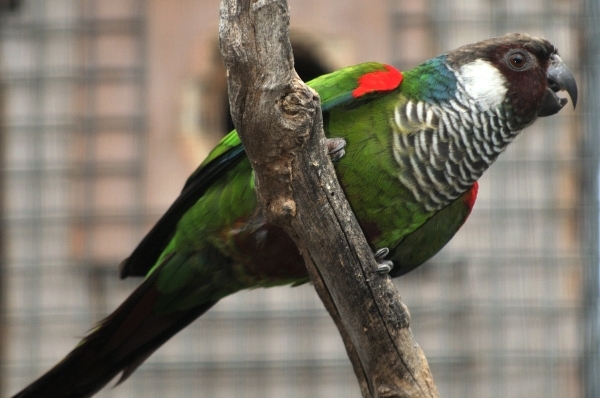 The main threats to the parakeets are the destruction of their Eucalyptus forest habitat for timber and, discovered by researchers of the National University of Australia, supported by Loro Parque Fundación, predation by sugar gliders. These small native Australian mammals were introduced into Tasmania in the XIX century and have a very high impact on the parakeets during their breeding season. They can predate up to 80% of nests, with the result not only of the loss of eggs and chicks, but in many cases also the death of the females. At present there are barely 2000 adult parakeets in the wild, and a recent study estimates that, if it continues this way, the population is going to decrease by 95% in the next 12 – 18 years, which inevitably would lead them to extinction. To avoid this, the species has been reclassified as critically endangered and the Australian government is taking actions to protect the habitat and to reduce the impact of the sugar gliders. At the end of the month I took part at the mid-year meeting of the Parrot Taxonomic Advisory Group of the European Association of Zoos and Aquaria (EAZA), which took place in Lagos, Portugal. There, diverse aspects of management were discussed, such as different options to reduce aggression among cockatoos, or alternatives to create more space in zoos for the reproduction of the most threatened amazons. The situation of the Pyrrhura griseipectus was also discussed. It’s a species in critical danger of extinction whose wild population in 2016 was 314, counted at the roosting sites; a stable population but very precarious. The census is one among various elements of the conservation project that is mainly supported by Loro Parque Fundación, and carried out by the Brazilian NGO, Aquasis. The population under human care is ironically much bigger and could play an important role in the recuperation of the species. To achieve this, the most important actions are to protect their habitat and to stop the capture they are suffering. Once this is achieved, a possible conservation strategy could be the release of individuals born under human care to reinforce the remaining populations, or to create them again where they have been extinguished. Title photo: (c) writhedhornbill. This file is licensed under the Creative Commons Attribution 2.0 Generic license.